The post Episode 453 Scott Adams: Vetos, White Nationalists, Bernie’s Head Injury, Beto the Hacker, and Climate appeared first on Dilbert Blog. An awakening in progress. Am I being lied to by the media? Climate Change claims, BS or valid concerns? The post Episode 429 Scott Adams: A Possible Path Out of TDS Forming in the Zeitgeist, Catholic Church, Climate Debate appeared first on Dilbert Blog. The post Episode 423 Scott Adams: Scott Solves the Climate Debate and Saves the World (Really) appeared first on Dilbert Blog. The post Episode 403 Scott Adams: The Border “Emergency” and the SOTU, Climate Bubbles, and Hoaxed appeared first on Dilbert Blog. Will President Trump pardon General Flynn? Why can’t we have a “poor person’s insurance plan”? 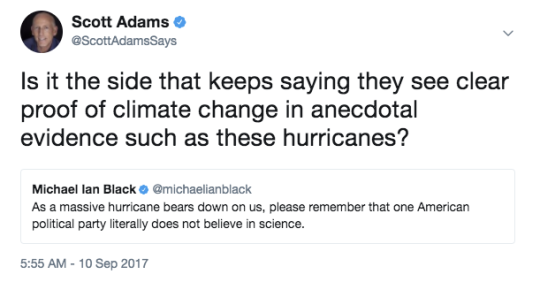 How can non-scientists know who is correct? Isn’t it 100% favor, and just a question of rate and process? China is an extremely successful country, why? Are more human rights always better? What happens to models that don’t support climate change? The post Episode 340 Scott Adams: Our Useless Congress, Climate Hoax, Flynn Pardon, Wall Funding appeared first on Dilbert Blog. The San Francisco Climate Trial (really just a tutorial) and how the climate alarmists are not making their case. The post Episode 11: The Climate Trial, Sinclair Broadcasting, and presidential priorities appeared first on Dilbert Blog. The "Straight Outta Compton" director also says it’s his responsibility to portray what happened with the group as "accurately as possible." President Barack Obama is a major fan of Sir David Attenborough, the celebrated British naturalist and TV host who has created and narrated numerous science and nature documentaries for the BBC. According to The Guardian, Obama invited Attenborough to the White House in May to celebrate Attenborough’s 89th birthday. While there, the two taped an interview, in which Obama turned the tables and interviewed Attenborough, telling him that he grew up watching Attenborough’s programs. The two discussed climate change, and Obama lamented what he sees as slow progress toward combating the issue. Obama asked Attenborough what he thinks needs to be done in the fight against climate change. Obama also discussed during the interview how growing up in Hawaii and Indonesia gave him a greater appreciation of the environment. Attenborough, a Cambridge-educated naturalist, has been creating and hosting science and nature-related programming since 1954. His shows have won numerous awards, and he has become a vocal environmentalist. He is known for his distinctive voice as a narrator. The Guardian reported that despite his long career, Attenborough had never visited the White House, and he said Obama’s invitation was “a considerable surprise.” The interview will air simultaneously on BBC 1 in the United Kingdom and BBC America in the United States on Sunday. This is not the first time Obama has turned the tables on a notable television figure he admires. In March, he interviewed David Simon, creator of HBO’s “The Wire,” about criminal justice reform, and told Simon that “The Wire” is his favorite TV show. Watch a clip of Obama’s interview with Attenborough above. Yasiin Bey refuses to be boxed into any rigid lines his fans may unwittingly try keep him in. The artist formerly known as the Mighty Mos Def recently detailed why he left the United States. In an interview with Beat By Dre, Bey explained why you’ll rarely spot him back in his BK stomping grounds—and why that has helped his music. Bey went on to say he is critical of all the governments in the world, and the corporations. Check out the enlightening interview below. This is where we put our wish for a new Black Star album out into the universie, hoping that it someday happens. The post Yasiin Bey On Why America’s Climate Makes It Difficult To Create appeared first on Hip-Hop Wired.